“The Artist” of the title is, I presume, George Valentin (Jean Dujardin), a silent film actor in the late 1920s, about to be rendered obsolete by the talkies. He isn’t much of an artist. Dujardin’s brilliant mugging as he acts the actor acting (if you see what I mean), his identikit pictures, his glamorous swagger: this is a star, and Hollywood is an industry. Michel Hazanavicius’s silent, black-and-white homage to the era uses great craft to pastiche an era when the craft was a little less sophisticated. Before sound arrives and the silent industry collapses, Valentin, at a premiere of his latest movie, literally bumps into Peppy Miller (Bérénice Bejo), who is in the mass of fans outside the theater. Their chance meeting is splashed over the gossip pages. That, of course, will not be that. She is hired as a dancer for Valentin’s latest feature; when she is recognized as the troublemaker from the newspapers, she is saved from being fired only by Valentin’s intervention. This first act was my favorite by quite a margin. Later there is classic melodrama, but first we have classic comedy. The stylized black-and-white, silent nostalgia worked a lot better for me in service of the light romp of the preening star than the descent to come later. And it does work. Dujardin and Bejo look just right, and survive perfectly well without words. For some reason I think Valentin and Miller’s cute-as-a-button spark as they catch the giggles while trying to film a scene would have been much less sympathetic with sound. Valentin is about to pass Miller on the way down, as the talkies will launch her to the top just as they cast Valentin aside. Their moment together is past unrequited, with Valentin returning to his distressingly complete alienation of affection for his wife, and Miller whisked off to stardom. It’s lucky that the brief scenes of their meeting work so well, since they have to carry the weight of the two stars’ opposing fortunes as well as the affection the two clearly feel for each other. What kind of affection is not clear. Maybe by the Hays-code constraints of the movie’s style, chastity is unbreakable? In this way the constraints bleed into the action, and I found myself wondering if there was anything we weren’t seeing. Valentin descends – at length – into booze and despair, and Miller works occasionally to help him, silently so as not to hurt his pride, but the precise why stays unknown. I thought as the pace settled down while Valentin falls, the stylistic facade seemed a little less convincing. An homage to comedy still gets to tell jokes after all. It seems to be that pride that does Valentin in, but again I wasn’t sure exactly why. At the moment his fortune turns, Valentin’s producer Al Zimmer (John Goodman) shows him a screen test of an actress with sound. Valentin leaves, laughing. Is he being forced out of the industry, obsolete, as Zimmer claims later? Or is he walking through the door alone, refusing to ride this new wave, unable or afraid? At times it seems to be him, and at others the world. I suppose things always seems a little that way when things are going badly. In any case the movie certainly doesn’t seem to take a stand one way or the other. 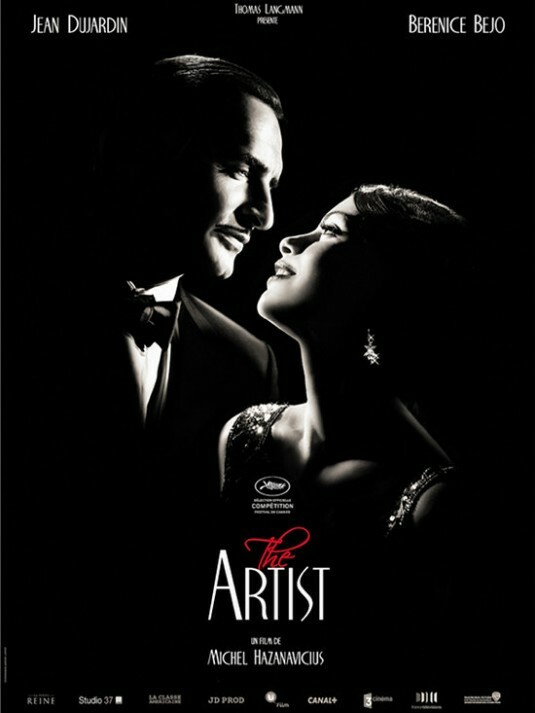 Which is fine; “The Artist” is a sweet confection, not an exercise in whys. To revel in the sights, sounds and mechanics of a bygone era seems to be the goal, and the material itself is very much a square peg for the square hole of the style. I wonder whether the same nostalgic style could ever work with something a bit more complicated, or if the medium really constrains the possibilities of the story. Does silence restrict a movie to simple emotions, or does everything just look simpler in silence? You need to update more often.